​Maximum occupancy is 6 - No exceptions. Many a Christmas was celebrated in Greenwood through the years. 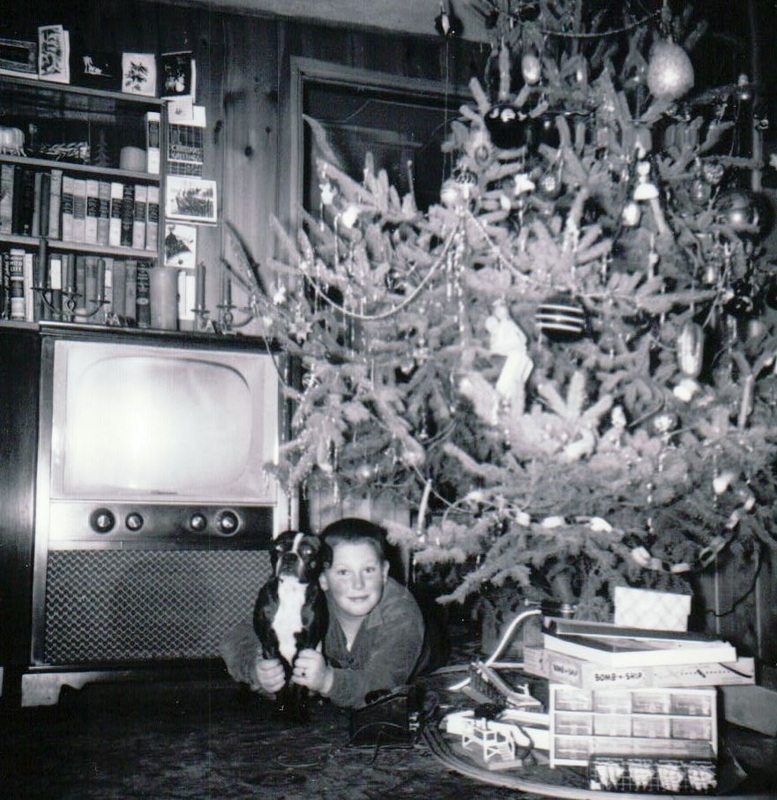 Here, Jay Olson and Bozo pose under the tree in the 1950s. Greenwood Cottage has a charm all of its own. Greenwood is situated about one hundred feet from Lake Michigan, but it can be overshadowed by it's lakefront sisters. Greenwood offers most of what they do, at a slightly lower cost. Plus, Greenwood offers a huge kitchen/dining space and a far larger bathroom than our other cottages. You still have access to the beach and you'll have a wonderful outdoor deck to enjoy. Greenwood sleeps 6 and features 2 bedrooms (1 with full-sized bed, 1 with 2 full-sized beds), bath with shower, paneled living room and a beautiful knotty pine paneled kitchen/dining room. The kitchen features full-sized appliances and microwave and a large dining area that is just perfect for family gatherings. Greenwood features forced air heat for cooler evenings. Outside you’ll find a deck with umbrella, table and chairs. Greenwood has the cozy charm of a Northwoods cabin with the added benefit of one of the areas best beaches. Greenwood offers the greatest flexibility in availability and a slightly lower weekly rate. And, special 3-5 week pricing is offered, when available. Give Greenwood a try this season! Olson Cottages, LLC - 6846 State Highway 57, Baileys Harbor, WI 54202.